PoPville » Dear PoPville – How Do We Help a Bird trapped in DSW (Columbia Heights)? 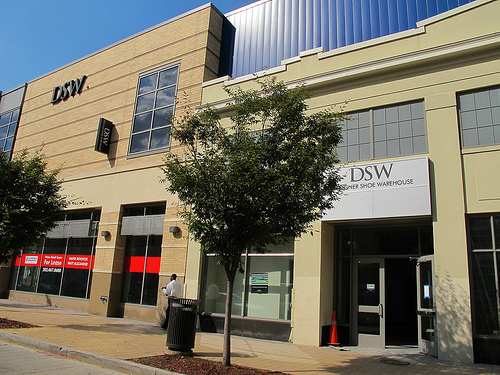 Dear PoPville – How Do We Help a Bird trapped in DSW (Columbia Heights)? I was in DSW earlier and witnessed a poor bird trapped in the store. He kept flying into the windows trying to get out. It’s so heartbreaking. I went to talk to the manager – he acknowledged that they have tried to call Animal Control ‘numerous’ times to capture the bird. In the meantime the have been trying to coax the bird outside, and they have been feeding him. I tried calling 311 over and over again (apparently Animal Control is available 24 hrs a day). Not once did I speak to anyone in Animal Control. All I kept getting is a recording to not leave a message and to call back when the line was free. Huh?!?! I did tweet @DOHDC with this earlier today – no response. I am not a DC resident so I am not quite sure what else can be done.